Circle skirts are a great staple for any goth wardrobe. They are fun to dance in, comfortable and flattering to just about every figure. Handkerchief hem skirts are also great, and super easy to make. Here I will show you how to do both. I'm also going to provide all the steps, including making the math as easy as I can, to take all the guess work out of doing the waist band and length measurements. First we'll do the circle skirt. You can make these out of almost any fabric. Keep in mind that if you are making a very long skirt, heavy fabric with a lot of stretch will most likely have to be re-hemmed after a few months as it will stretch out and hang a bit oddly. The amount of fabric you need depends on your height, girth and the length you want the skirt to be. The following may seem a bit complicated just reading through it if you aren't really a math person, but if you actually go through step by step and write everything down, it is actually quite simple. As with all sewing projects, take your time and double check every measurement and calculation. First measure your hips write that down (we'll call that a) and add 2 inches, write that down as well (we'll call that b). If your weight fluctuates a lot use your best judgement in making it a bit bigger by a few inches. Now measure from your waist to where you want the skirt to fall, write that down (we'll call that x). Take b and divide that by 6.28 (That’s double pi, double the fun!). Write that number down (we'll call that z). To calculate how much fabric you need for the skirt add z + x multiply that by 4 then divide that number by 36 and add an inch or 4 to get the number of yards you need. You add the extra few inches so you have a little wiggle room in how precisely you fold the fabric in the next step. If you are very tall and want a floor length skirt you may have difficulty in finding fabric wide enough. I will address this shortly, er, pun unintended. Inches and yards not your thing? Measure in CM. Instead of 2 inches add 5 CM. To get the fabric meters needed divide by 100 instead of 36. Okay. You have your fabric. Lay it out on the floor folded in half. One side will be 2 edges and the other will be a fold. Weight the corners, and place a weight at the top center point as per Figure 1. Tie a string to the center weight at the other end of the string tie some Taylor’s chalk or a piece of soap. 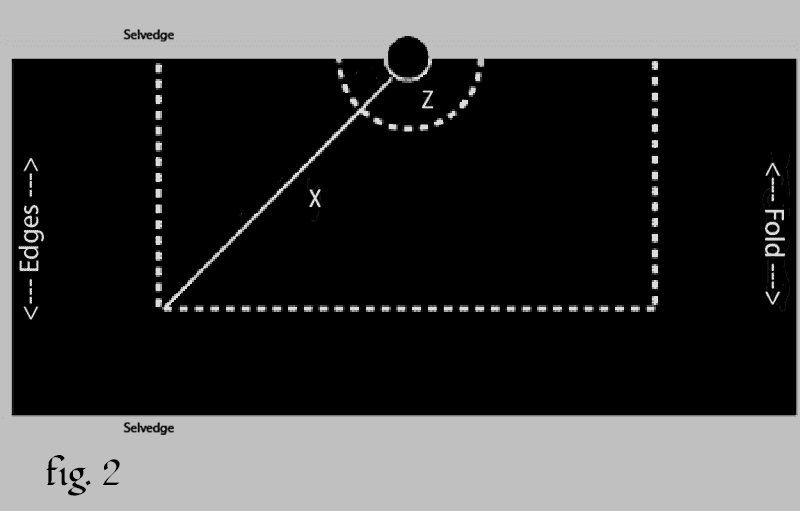 The length of the string between the chalk and the weight should be equal to z + x. Draw a half circle from one side to the other, then cut along this line. Shorten the string to the length of 'z'. Draw that and cut this is where you'll be making your waist band. Now what you have are 2 doughnut halves. With right sides together sew these along the straight edges for a full doughnut. You have a few options for making the waistband. One of my favorite cheats, and this is the easiest way to make a comfy waist band, is to cut the waist band off an old pair of black leggings or sweat pants. The elastic has to be in good shape, but if you cut an inch below where the elastic track is sewn and sew that onto the skirt, you have instant waist band! You can also buy slightly wide skirt waist band elastic that is pretty much ready to go from a fabric store and do the same thing. You will have to stretch it out to match the inner circle of the skirt. I’ll let you work out what method works best for you. Another easy way to make the waistband is to use blanket binding or wide bias tape in a colour that will match your skirt. If you want a waist band the will match the skirt exactly, make a track for the elastic that is as long as 'a'. Get the width of your elastic, get 3/4 to 1 inch the non roll kind, double that and add 2 inches. That's how wide the track fabric should be. Cut the track from the leftovers from the skirt. Fold it over and sew down the length of it leaving enough room to pull the elastic through. Now pin your waistband to the skirt. You will want to have the right side of the skirt up, and the side of the waistband that will ultimately face out laying on top of and facing the skirt. In other words, right sides together.Now sew very close to the inside edge of the two. You want the elastic to be short enough to hug your waist, but be long enough to easily go over your hips when it's stretched out. Add a few inches to this for seam allowance. Thread the elastic through the waistband. I find attaching the elastic to a straightened coat hanger and pulling that through with the elastic behind it does the trick. Others like to get a very large safety pin and work that through. You can do a similar thing and thread a cord instead of elastic if you'd prefer a draw string. Just leave or make an opening for the string to come through so you can tighten and tie. Now you can leave you waistband like this and attach as is, or stretch it out and run a zig zag stitch over the band, looping it through the machine so the elastic doesn't slide around as much. This is what I usually do. After this, the only thing you have left to do is hem the skirt. This can be a tedious and time consuming task. If you made it a bit too long, you may want to get a friend to help you pin it up. If the hem is wide, when it is turned under you will have to snip little corners off of the upturned fabric as you go so it will lay flat. If this comes up, you will know what I’m talking about, so don't worry about it otherwise. If you cut it pretty much the correct length, and the fabric isn't so stretchy that it will need to be hung for a week and have the saggy parts trimmed; you can run a stitch around the bottom of the skirt about 1/4 inch from the edge. Now fold the edge towards the wrong side along the stitch, then fold it again and pin it in place. Once the hem is stitched together the raw edge of the skirt fabric will be completely covered. This is especially great if you are using fabric that will unravel easily. Ugly hem stitches? It happens to the best of us sometimes. Redo or just sew some lace trim or ribbon over it. IMPORTANT! When cutting the fabric out you will need to leave about an inch around the pattern for seam allowance if you want a full circle. Use the pattern pieces twice so you have a full circle’s worth of pieces. Want a circle skirt out of panels of different fabrics? This works for that as well. This is very similar to a circle skirt, except you are working with a square rather than a circle. The trick here is balancing the height of the crease with the length of the point. I usually calculate the length I want the points to be and treat it like 'X' above. 'X' won't be on the same place with this skirt, however, it will be at an angle. If you are making a smaller skirt fold it so it comes out as one piece instead of 2 so you will have no side seams. So the fold would be at the top of figure 2 in that case. Calculating how much fabric you will need for this skirt is a bit different. You will actually need a bit less than for the circle, but for simplicity's sake just go ahead and calculate it the same way. Layering progressively shorter layers on top of longer ones looks really great. It's also cool to make some layers circle and others square, or to stagger 2 handkerchief skirts (even of the same length) so you have 8 points instead of 4. If you are making a multi layered skirt, just cut out your doughnuts, and/or square doughnuts, and baste them together around the inner circle opening before sewing on the waistband. One super flattering way to layer them is to measure the length of the over layer from your hips instead of your waist. Top stitch the over layer at hip level, then stitch some trim over the top stitching to finish it off. This looks great with solid fabric as the underskirt and lace or net over it. The more texture the better!